I am using an IBM M1015 card in depot. 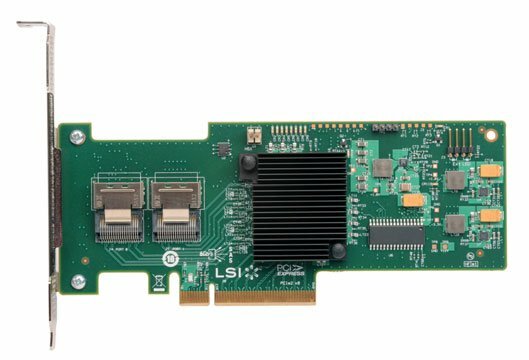 It is an SAS2008-based card, and normally comes with RAID firmware ("IR"). In order to make best use of it with ZFS, it should be reflashed with "IT" (Initiator Target) software. This provides simple pass-through, which is best for ZFS. The IBM M1015 can connect 8 SATA drives at 6.0 Gb/s. The simple reason to use an IBM M1015 for FreeBSD 9.1 with ZFS: they can be had at very low cost on eBay. I got mine for $79. However, be prepared for some work to get IT software loaded, unless you can find a seller who will preload it for you. I created a bootable FreeDOS USB stick and placed the LSI "IT" firmware on it, along with LSI's software for reflashing. I also created a disk image from the USB stick when I was done, using Disk Utility on my hackintosh. The disk image can be used to recreate the bootable FreeDOS USB stick as needed. Since the disk image already includes the LSI firmware and software, it has everything needed to flash the IBM M1015 with "IT" software.